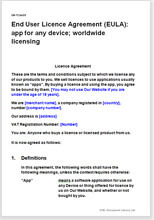 Here is your website downloaded app licence agreement (“EULA”) for any device. The licence assumes you are selling World wide to anyone who wants to buy. You may be selling one app or many. You may have written them yourself, bought them or licensed them for you to exploit the sale to end users. Over 1,300 words of helpful and informative drafting notes.